Source: DuMoulin, Andrew. 2011. Winning Open Space Ballot Measures. 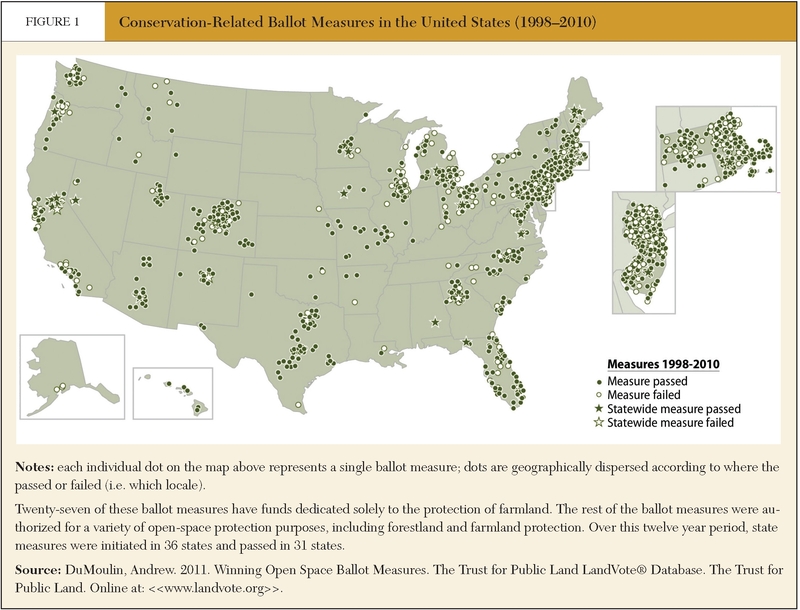 The Trust for Public Land LandVote® Database. The Trust for Public Land. Each individual dot on the map above represents a single ballot measure; dots are geographically dispersed according to where the passed or failed (i.e. which locale). Twenty-seven of these ballot measures have funds dedicated solely to the protection of farmland. The rest of the ballot measures were authorized for a variety of open-space protection purposes, including forestland and farmland protection. Over this twelve year period, state measures were initiated in 36 states and passed in 31 states. Successful measures appear to be more prevalent in areas with large population centers.